Today, I applied to Amazon’s affiliate program, called the “Amazon Associates Program.” I received an email indicating that my profile is now active. However, as I understand it, I now have an Associate account, but I am not fully an Associate yet. There are three steps to becoming an affiliate for Amazon. First, you have to submit an application. Second, according to the email I received from Amazon, I have to start advertising on my site to “drive at least three qualified sales within 180 days” [emphasis added]. If I don’t meet that requirement, my Associate account will be terminated. Third, after I have met the second requirement, my website will be reviewed by Amazon’s specialists to determine whether my site will be accepted to the Amazon Associates Program. I mentioned that I already have a profile. Inside this area, you can manage your account settings, review payment history, and manage your tracking IDs. So, I went to the area of the site for managing tracking IDs to see if I could delete the “-20” part. I could not. As Amazon explains, it adds extra characters to the ID “to signify the region of the Associate,” and -20 signifies that the associate is in North America. Anyway, inside Amazon Associates Central, you can also use a menu to find information about product linking, promotions, tools, and reports. There is also a search form to find and create links and a dashboard that displays an overview of earnings. I am going to spend some time familiarizing myself with the information and resources within Amazon Associates Central. So far, I really like that Amazon offers many ways to link to its products. I have been having fun exploring the many ways that I can link to Amazon products. One way is to link directly to a specific product. You simply search for the product, select the product, customize the way the product is displayed, and generate the HTML code. For example, below is a text link for a Casio G-Shock GX-56BB Blackout Series Watch on Amazon.com. This link contains my affiliate tracking code, so if you click it and make a purchase on Amazon I could be paid a commission. I am using this item as an example, because I purchased this G-Shock model from Amazon.com, and I love the watch. In fact, 7 months ago, I made a YouTube video about this G-Shock Blackout Series watch. The example above is a simple text-only affiliate link, but there are many ways to link to products. You can use a photo only link or a text and image link. Aside from product links, other linking methods include banners, native shopping ads, and mobile popovers. I intend to learn more about these methods, and explore integrating them into this website. 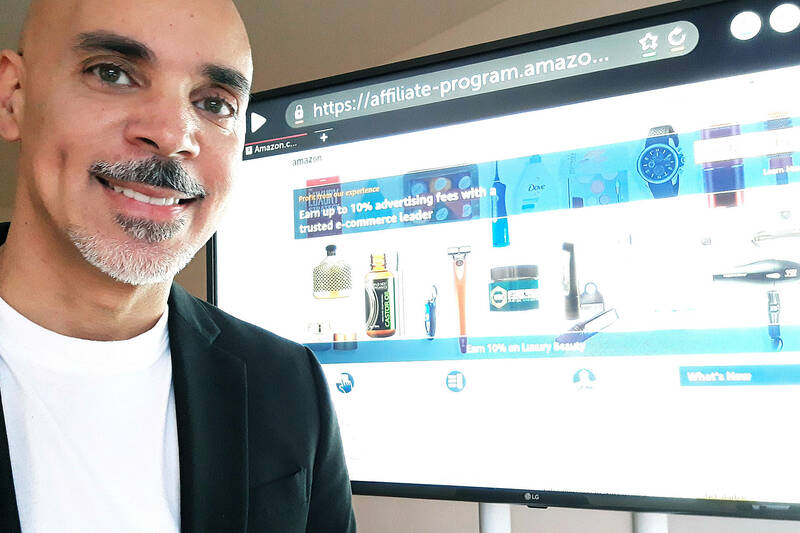 Another aspect of the affiliate program that I like is the ability to advertise Amazon promotions, deals, and promo codes. I am excited about reviewing the various offers and presenting those which I think my audience might like. I am especially interested in this, because I am now thinking about integrating a section of this website that features promo codes and great deals. I have only 180 days to make the requisite sales needed to be accepted into the program. You can help me by sharing this blog post or my website on social media. I need to generate a lot of traffic, and I need as much visibility as possible.